On my final morning in HK I went to the very west of Lantau Island to look for a Blue Magpie. They looked pretty cool, all blue 'n all, and with a red bill. I didn't see one. But I did see a pink Dolphin. Yes, you heard that right. A *pink* Dolphin. I rarely see grey Dolphins, although I did once find the remains of one in my garden, so to see a pink one was somewhat mind-blowing. There I was, minding my own business along a ridge at Tai O, with views out towards Macau and Pacific and House Swifts zooming past my nose, when a bloody pink Dolphin jumped out of the water. Gobsmacked I was. I imagined people might question my sanity, ask about drug intake levels and so on, so I took a photo. Boom! This has not been photo-shopped or otherwise messed with (though as per usual I did remove a few twigs....). 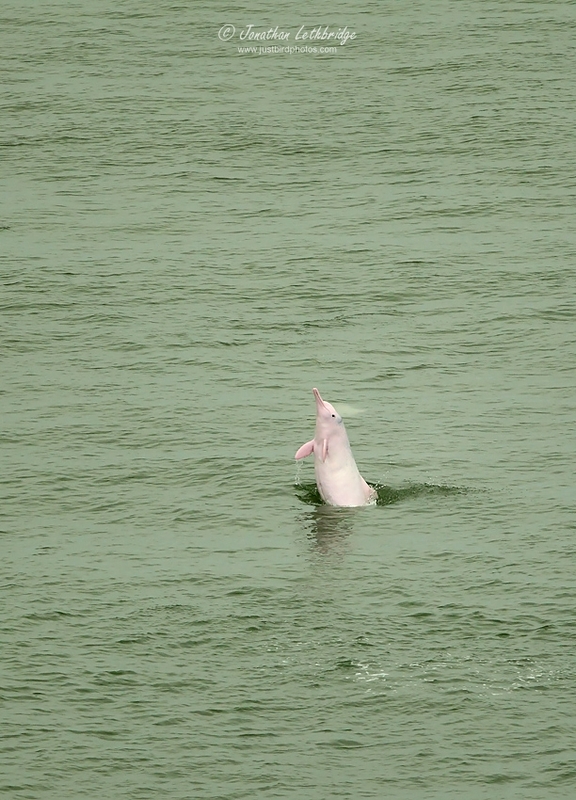 It is genuinely pink, and is of course one of the few remaining Pearl River Dolphins, otherwise known as the (very poorly-named) Chinese White Dolphin. It has another name as well, but I can't remember what it is, but it doesn't matter as it's basically a pink Dolphin, and any sane scientist should have named it that instead of anything else. 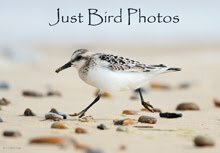 There are a few populations along the South China Coast, but this is the most well known, and probably the most threatened, as HK expansion continues apace. The new airport at Cheng Lap Kok was in their favoured habitat, and of course now they're building a massive bridge right across the bay to Macau, which is unlikely to help. I don't know what the latest number is, but the general trend is likely one of decline, through pollution as much as habitat destruction. I saw around five or six animals, all bar one of which were most definitely pink (the other was a disappointing spotty grey, a real let down). This is probably a relatively meaningful part of the HK population. I was miles away on the land, so the photo is an uber-crop, but apparently you can take boat trips to see them. If you're into cetacean listing, I recommend you go sooner rather than later, as the Pearl River delta will probably be a Shenzen car park by 2020. Also stonkingly rare is the Black-faced Spoonbill, though I think I read that they are on the up, unlike the Dolphins. I saw around 30 at Mai Po on my one day of birding, which is also a healthy chunk of the global population. 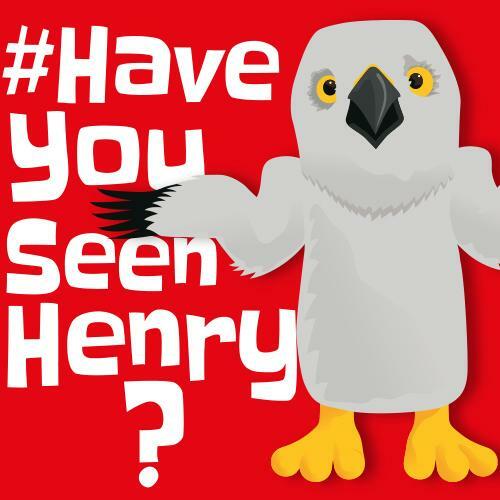 Let's be clear, people are campaigning for the Hen Harrier, but actually there are a lot of those. The issue is that there are none across large swathes of the UK that by rights should have lots of them. 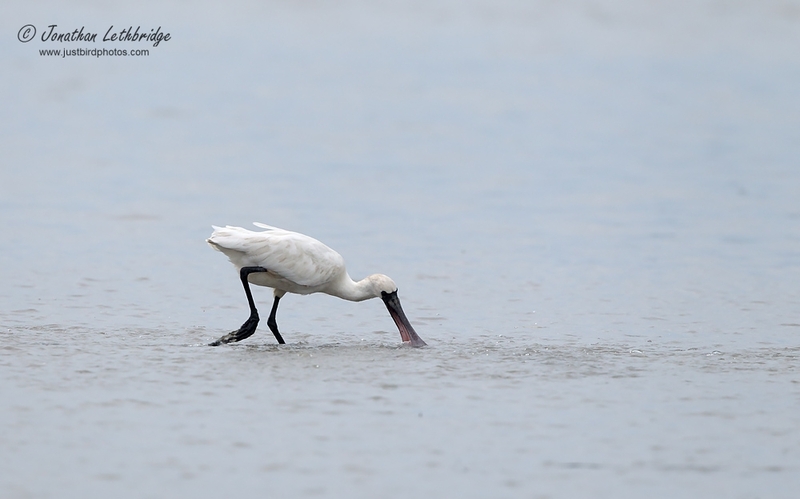 The total global population of this Spoonbill is between 2-3000 birds. Tiny in other words. The number of Dolphins is perhaps similar, though the number remaining in HK waters is less than a hundred (Wikipedia is my friend...), and that's a very small number indeed in terms of what you might call self-sustaining. Conservation efforts are underway, but against the might of far-eastern industrialism and from what I've read I'm sceptical about the long term. Like I said, if you want to see them, go sooner rather than later would be my advice. Great to see you connected with the dolphin (a terrific shot! ), if not the magpie.